We've been following the progress of our new neighbor—the University Medical Center of Princeton at Plainsboro—for the last four years, including a presentation from Princeton HealthCare System's Vice President Pam Hersh at our brunch in 2009. This Saturday, May 12, UMCPP is hosting a community open house from noon to 6 pm. 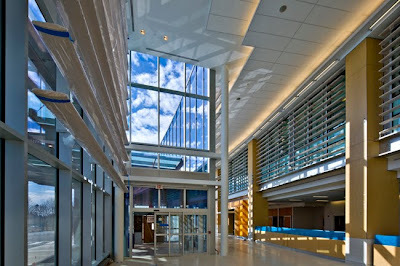 Visitors will be able to get a first look at the hospital, meet the staff and go on tours. There will be screenings, entertainment and refreshments. RSVP by registering at princetonhcs.org/openhouse or call 1-888-897-8979. When you pre-register, you'll be entered to win a 36" flat-screen TV. Cars that have a visible Handicapped Parking sign will be allowed to park at the new hospital. All other guests must park at nearby lots and travel to and from the new hospital on buses, which will have door prize drawings during the ride. Look for Event Parking signs in Plainsboro. If you are using a GPS, use 600 College Road East, Plainsboro, NJ as the address. Some GPS devices may require you to enter Princeton instead of Plainsboro. This event is free.